Not So Cli-Shéa: Tutorial Tuesday! My best friend Danica and I love any excuse to get together and craft. I'm a crafter by nature and she has become one over time and has become quite the crafting buddy! So, we decided to get together to do a Fall/Halloween craft. 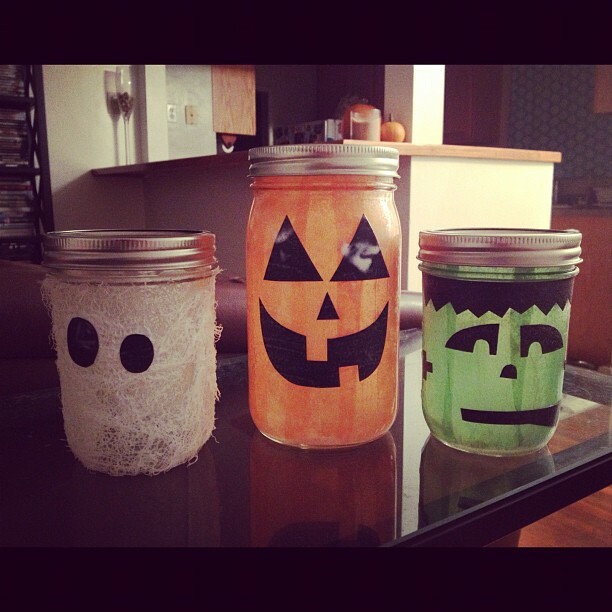 After searching around pinterest, I found these cute Halloween inspired mason jars. Danica was on board so this was going to be our craft of choice. 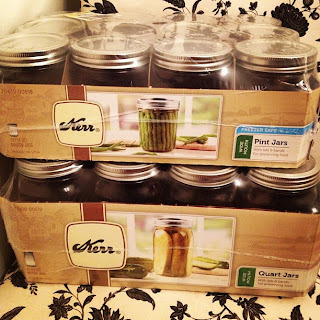 I have what is referred to as the "craft cave" with pretty much every craft supply known to man BUT I DID have to go out and buy the mason jars (they were about $10/case which is less than a dollar a piece, not bad). I got two different sizes because I feel like varying sizes makes it more visually interesting. So, I started by cutting the tissue paper into strips about 1.5 inches. 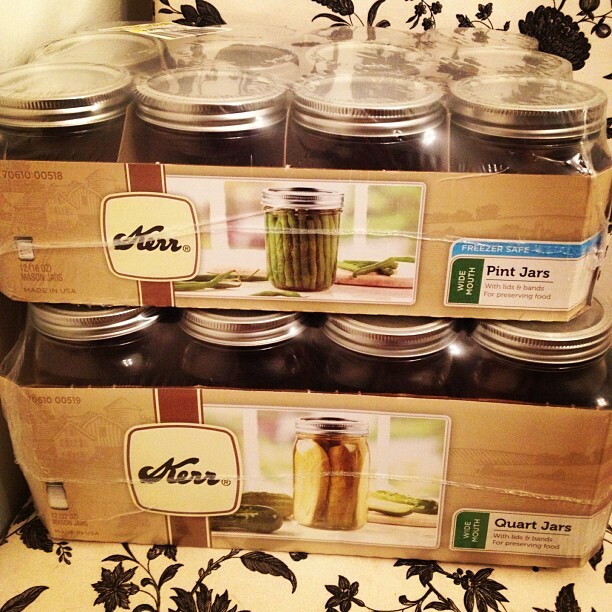 You can measure your jars to see how tall the strips need to be and cut them accordingly. Here is where we did things a little differently... The original tutorial (found here) placed the Mod Podge and tissue paper on the OUTSIDE of the jars, while we chose to put it on the INSIDE. I think that it proves to be a little more difficult that way but makes for a cleaner look in the end. 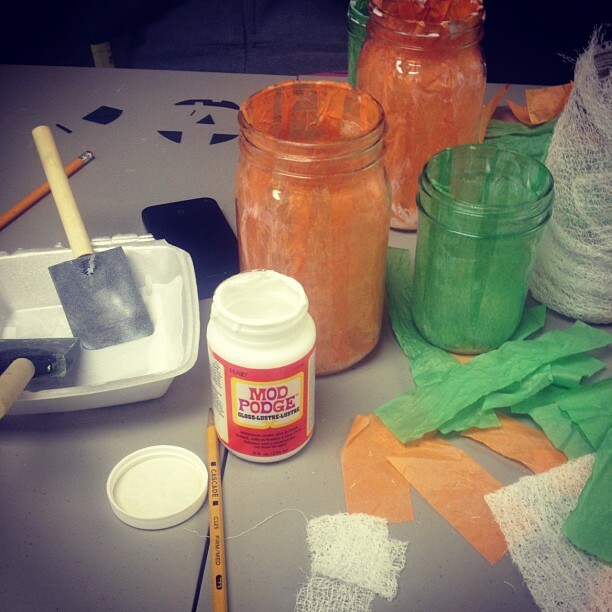 So, as you can see we did a coat of Mod Podge on the INSIDE of the jars and placed the strips on the inside. We used the eraser on a pencil to help flatten it out and ensure that it was down. Then we put another layer of Mod Podge over to set it. 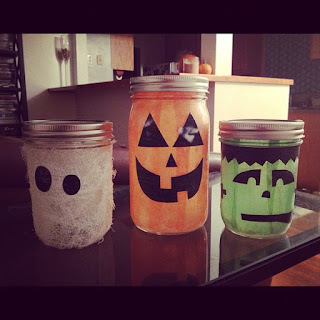 Then we got creative and made faces for each jar. I decided to do just a pair of eyes for my mummy (which I guess could also pass as a ghost unless you see the gauze up close. haha). I did a standard pumpkin face for the pumpkin (and as you can see I went a little crazy with the Mod Podge and perhaps put a little too much on his eyes). And lastly I created a little Frankenstein face, bolts and all, for Frankenstein. To apply the face parts, the same technique was used, putting a layer of mod podge on the jar, placing the face and adding a layer over top to set. On a side note, since this was a crafty post, I just have to share my latest crafting toy. So... to give a little back story... Yesterday while I was at work, my boyfriend sent me a craigslist link for a vintage sewing machine. I thought it was so sweet of him to see that and think of me. I even sent the link to Danica and we both agreed it was a really cool piece. After work my boyfriend calls me and asks if I can go in the garage to look for something for him. I turn the corner and what do I see? He contacted the seller and went and picked it up to surprise me! How lucky am I?! I literally almost started crying. Haha. He sure knows the way to my heart... ANYTHING CRAFTY! Haha. The seller told him that everything works and I'm looking forward to testing it out. I mean, truth be told, even if it doesn't actually work I still LOVE it! If you have any question or comments about the tutorial feel free to let me know and be sure to check out Danica's post on it as well! I would be surprised if that machine didn't work. Those old machines were made to last. 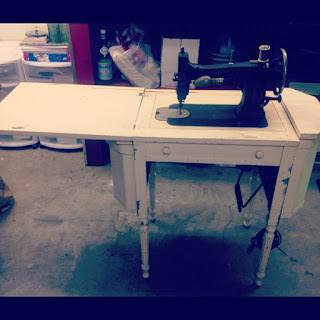 My mom was an AVID quilter and had a new top of the line machine, but would always go back to her old machine, which looked a lot like yours. I still can't get over how cute these jars came out! They make the living room so festive! Maybe some Santa or elf ones for xmas? Kudos to the BF for the amazing surprise!